The National Weather Service issued a flash flood watch replacing the earlier hazardous weather outlook for Orange, Putnam, Rockland and Westchester counties. The flash flood watch comes into effect from November 9, 06:00 PM EST until November 10, 06:00 AM EST. 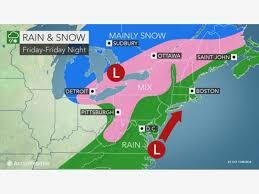 Low pressure is expected to approach the tri-state area on Friday and pass through during Friday night. This will bring a period of moderate to heavy rain to much of the area. There would be heavy rains, gusty winds and falling temps. It will bring lake-effect snow to western New York. Rainfall is expected to begin from Friday afternoon, and become heaviest during the evening. Rainfall amounts will average between 1 and 2 inches, however, locally higher amounts may be possible. Heavy rainfall coupled with leaf-clogged drainages will pose a threat for flash flooding across the watch area. In addition, quick water level rises are possible across small rivers, streams, and creeks, with flooding of adjacent areas. Alex Marra and Bill Potter of Hudson Valley Weather say that rainfall amounts would increase as one moves further South. The fallen leaves everywhere could increase flooding and also create tricky travel conditions. Steve Travis, AccuWeather Meteorologist says that evening commute could be troublesome. Travellers may align their travel plans accordingly.